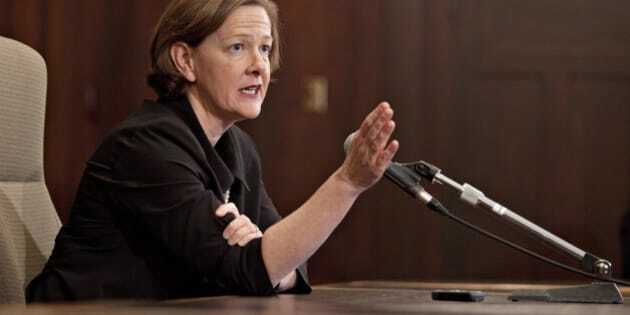 Alison Redford resigned as Alberta's premier more than two years ago following a scandal. EDMONTON — Alberta's ethics commissioner is asking her counterpart in British Columbia to decide if there should be a renewed conflict-of-interest investigation of former premier Alison Redford. In a letter to Alberta's Justice Department, Marguerite Trussler says she cannot give her opinion because she is friends with two of the people involved. "I am not able to take on the task of providing you advice on this matter as I have what could be perceived as a personal conflict of interest,'' Trussler wrote in the letter Tuesday. Trussler has worked as a lawyer and as a judge in Court of Queen's Bench. Trussler says in the letter that B.C. conflict-of-interest commissioner Paul Fraser will step in to decide if an investigation is warranted. Redford resigned as Alberta's premier more than two years ago following a scandal over lavish spending on herself and those in her inner circle. Then-ethics commissioner Neil Wilkinson investigated her in 2013, while she was still premier, for a decision she made in 2010 while serving as justice minister. Redford had selected the ITRL consortium, a group of law firms, to sue tobacco companies on behalf of the province to recover related health-care costs. One of the law firms in the ITRL consortium includes the firm employing Robert Hawkes, who is Redford's former husband and became her political adviser. Wilkinson's investigation found that Redford made a fair decision based on the advice given to her to pick the winner from three equally strong applicants. But a CBC report said Wilkinson may not have had access to all the relevant documentation to make a sound decision, so Justice Minister Kathleen Ganley asked former Supreme Court justice Frank Iacobucci to investigate. On Monday, Ganley released Iacobucci's report. He said Wilkinson was not given all the information and an earlier recommendation dismissing ITRL's bid as inadequate was removed from the final briefing document given to Redford. ITRL remains in charge of the $10-billion lawsuit and Ganley said there's no reason to change. She has also said that even though Redford is no longer a sitting legislature member, the matter still needs to be examined so that people can have confidence in the integrity of government decisions.